When developing systems, notably ones involving document mis.. uhm management, developers are confronted with the question of where they should store their files. A simplistic (easy manageable / codeable etc) approach is to simply store/stream the files from a database - unfortunately this approach comes with a performance penalty especially when working with large files. The alternative (like seen in the preceding quote) is to store files on the file system, which unfortunately introduces a number of manageability issues like security, integrity etc. 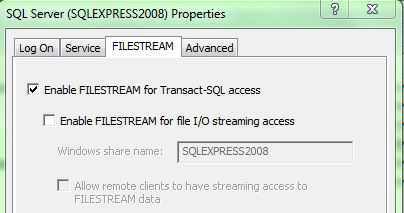 In SQL 2008 however, Microsoft attempts to give us the best of both worlds in the form of the Filestream feature, in which files(blobs) are stored/streamed via the NTFS file system - all managed by SQL. Lets have a look at how to use/enable this functionality. Run the following commands on the master database of the SQL server instance you enabled the filestream feature on (note that its required to restart the instance after running these commands). For the purpose of this post create a folder named demo, the following query will create a filestream enabled database. That's pretty much the basics around setting up the Filestream feature within SQL 2008. If you're unsure about how to retrieve/stream/add files to the filestream, click here for some clues.